Everybody loves gifts, but they do put a lasting smile on the receiver’s face if it looks amazing when they see you in your hand coming towards you. Of course I am talking about Gift baskets, these amazing baskets can be designed from scratch and can easily be made specifically for any person or any occasion, so without further ado here are some of my favourite DIY gift basket Ideas. This accordion style gift basket video tutorial from StylEnrich will touch anybody’s heart with its cute charm. Take 3 colour chart paper in A4 size. Fold and cut the paper in half by lengthwise then cut it. You will get 6 pieces of paper from these 3 sheets. Start folding the paper to make folds like an accordion or small strips. Do this with all 6 pieces of paper. Paste these accordion pieces together from the shorter sides using a glue gun. When you will paste them together it will form a full circle. For the base you will need to cut a circular shape out of cardboard. To cover the cardboard, you will need to cut out a piece of 14 x 14 cm of chart paper and trace the circular cardboard on it and make small cuts around the circle drawn. Apply craft glue then put the cardboard base at the centre and wrap it. Now take the accordion shaped circle we made before and give it a basket like shape, then paste it on the cardboard base. For the handle cut a cardboard strip 2cm wide to form a long strip. And to cover it two strips 4 cm wide of coloured chart paper.by pasting it from both sides. For flowers we will take white coloured paper and cut in squares measuring 5.5 x 5.5 cm. Fold it twice in half and then in a triangle and cut a petal like shape out of it. This will give you a paper flower, make multiple flowers by repeating this process. Paste these flowers on the handle of the basket, at the bottom fold these flowers in half and paste on the sides. For finishing touches decorate the basket with pearls where needed and voila your basket is ready. 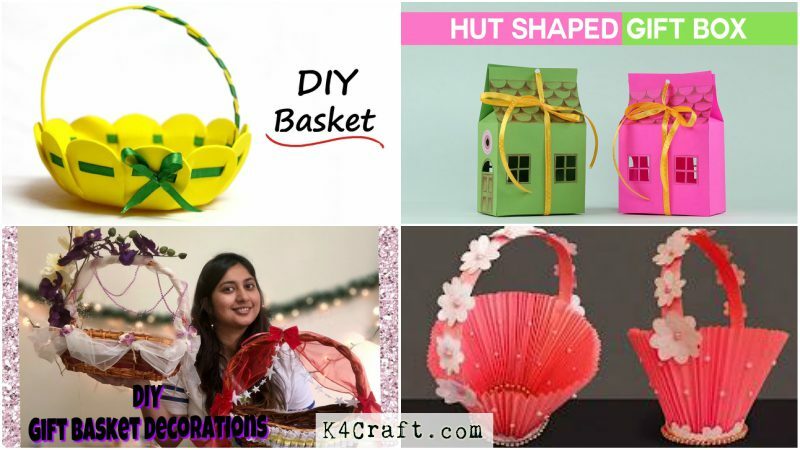 If bold is the way you want to go, this video tutorial from Little Crafties for bright basket from is a sure way to grab attention in those boxes of gifts which look bland and boring. Then draw the floral outline on the foam sheet and from the centre of the traced flower draw a circle for the base. With scale and pencil draw the same pattern again on the foam sheet. Draw another circle within the edges of the petal and put mark lines a cm from the end of each vertical line of each basket section, this is where your ribbons will go through. Cut along the lines of the basket sections and edges neatly to take out your foam basket outline. Also cut along the lines of the basket sections. Now fold the edges so that you can open notches for the ribbon, then pass the ribbon through each notch. Then tie at the end in the form of a bow. The basket now done, cut out a foam strip, and if length is less use two strips if need be. Wrap some ribbon diagonally on half of the basket handle tightly, and paste the ends on it. Then take the handle and paste its ends on the inside of the basket. Your basket is now ready to be filled with gifts. Since its somebody’s wedding you one might not be enough, this video from Bee Kreativee solves this problem and tells you how to do a gift basket two ways, double the fun! Take the straw basket and a ribbon of net fabric and wrap it around the handle. With the natural twine tie the fabric at the ends and in the middle. Then take more fabric and tie knots at suitable distance to give it a stylish look, then take this fabric and fix it to the upper edges of the basket using a glue gun. Now use the pearl ribbon on the handle for decoration by hanging it in form of long strings. Taking the flowers and tying them at the end fix it accordingly from the tip of the handle to the middle. Use small flowers where needed to finish the basket. Take the basket and put some glue on the handle using glue gun. Now take the red fabric and put it on place it on the handle with the fabric falling from both sides of the handle freely. Using the red ribbon tie a knot at the crown of the handle and at both the ends of the handle and cut the leftover fabric. Paste the white and golden ribbon on the edges of the basket. Take the star ornament and fix it around the edges of the falling end of fabric and in the middle using glue gun. Take some more ornaments and attach them at the crown for one end. Take bows and attach them at the ends of the handle and one at the top of the handle. Do try this and surprise everyone. This cute house shaped beauty by Crafting Hours is perfect for any housewarming or any other event, it’ll leave anyone wanting to open it soon. It even has windows and doors with openings for a sneak peek! Make a house drawing on the sheet of craft paper then cut out the undesired pieces from the shape of the house. With the help of paper cutter cut out the windows and sunroof above the door drawn. Using the glue gun paste the circle cut-out above the door to make a round window, cut out the inside region. Erase the unrequired lines. With the help of a coloured pencil draw the roof pattern, the door, and press along the folding lines and flaps using a ruler. Paste them together using a glue stick leaving only the top open. Punch a hole in the top and use a ribbon for closing it. Fill your basket and you’re ready to go. For those who love a little TLC and self-pampering, this cute spa gift basket by Show Me Cute is sure to make them feel refreshed and relaxed by seeing it as well as using it later. She even has links in the description for making the gifts for the gift basket as well. Fill 3 /4th of the with shopping bags to give a lift to the objects filled in the basket so they are clearly visible. Use the striped tissue paper to tuck in above the bags to cover them and put crinkled paper in basket and spread it evenly. Place the gift items in basket, as the decorations will be placed around them only. Place the striped paper in the back by folding it in a cone like shape and do this using multiple papers and at the whole back end. Add cute adornments such as flowers, feathers etc. Need something cooler than a normal fruit basket? This easy to make cardboard fruit basket is just what you need. This velvety basket from Sonalis’s Creations is sure to be a hit. Cut out fabric a bit larger than the circular cardboard piece of diameter 14 cm to cover it by pasting fabric with Fabric glue. After cutting put slits at the ends so it can be pasted at the back of cardboard. Cut out another piece of the same size to neatly paste and cover the other side of the cardboard circle. Using paper cut out a 2 x 6-inch piece, fold it in half and draw a half arch at one end and cut it out. This will give you a section of basket sides to trace and cut out from cardboard. Cut out total six pieces of cardboard for the basket and trace the pieces on fabric to cover them as well. Follow the same process as you did for the circular piece that is cut the fabric and paste it from both sides. After all the pieces are done start pasting them on the circle and simultaneously at the sides together using a glue gun. After the pieces are in place cut a piece of fabric to from a border at the bottom of the basket and paste it around the circumference. This will also give extra stability to the basket. 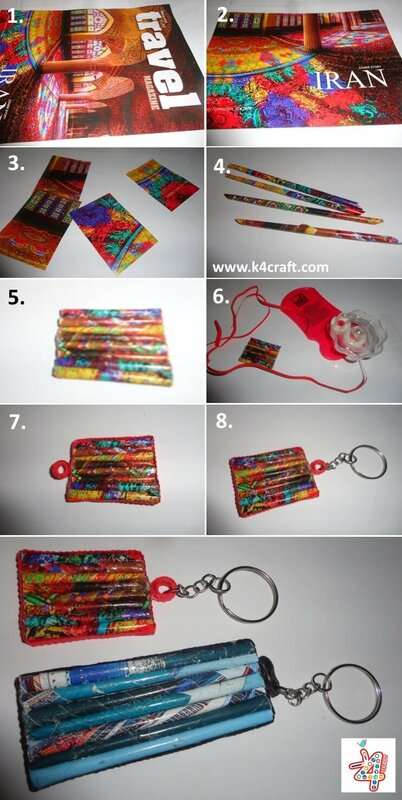 Take a cardboard strip of 1.5 x 14 inch and cover it with fabric by same process as above. This will form the handle of the basket. Paste it onto the basket and you’re done. Take a large rectangular piece of cardboard with size according to the frame it should be larger. Cut the piece of velvet to cover the piece of cardboard then fix the frame on one side completely. Take lace and fix it on all corners of cardboard. Use rhinestones or decorative stones on the frame and paste them at all the edges. Take the straw mat and cut as required in rectangular shape to form the doli. Cut thermocol to make the base of the doli and cover it with fabric using glue gun. Before pasting the base of doli to the straw mat make a doorway at both ends by cutting it, then using lace to decorate the edges of the doors. Use a red net fabric for making the doli more realistic and use more lace at the sides fix the fabric appropriately. Tie aa knot at the top in the fabric to give it a more alluring look. Add pom-poms, lace and more details to the doli. Take rolls of paper and paste them to from rolls to resemble the logs in the doli at both ends. Cover these with lace to make them that oomph. Paste them to the sides of the doli and cover the open ends with pom poms. Use other ornamentals like fabric birds, at the insides of the frame. Place the gifts inside the frame in an artistic manner and this amazing gift package is ready. One can never forget to give their mother something nice on mother’s day. Give some love back to your mother by giving her this joy filled gift basket to show how much you care. Chanelle Novosey is here to the rescue with her DIY gift laden basket for your mother. Even the gifts are DIY which leaves room for personalisation. Use the vinyl letters to take out three sets of letters m, o and m. Now take the diamond ribbon and cut out two sets of M O M letters again. 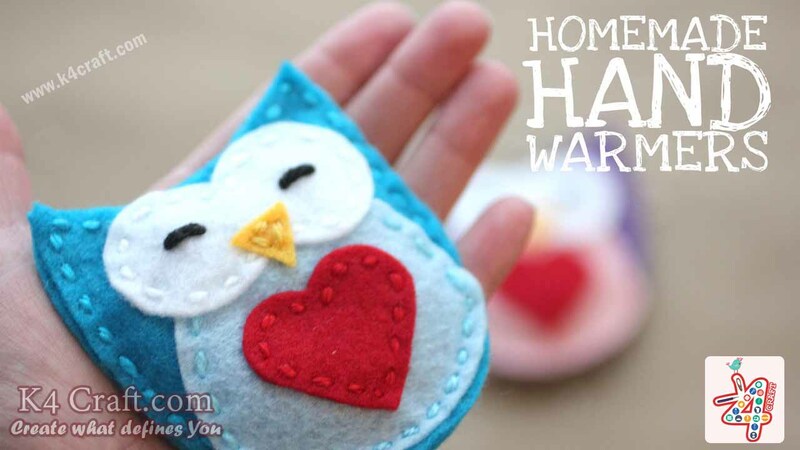 Now take the slippers and fix appear or fabric in It so that it doesn’t move and with the help of a glue gun take the letters you cut out of the diamond wrap and stick them one by one. Cut out a small strip of the same diamond strip to make borders for the around the letters. Take a basket and start gluing the small flowers on the handle of the basket. Use a normal frame with the letters MOM written at the top and use metallic spray paint to paint it silver. Now use more glue and put it all over the frame, then pour glitter over it. Clean off the excess glitter and your frame is now ready. Now take the pink ribbons and tie it in a bow around the basket. Add tissue paper to the base of the basket, put the slippers and the frame inside and more gifts which are up to you or as suggested like a mother’s day card, mug, fan etc. Your basket is ready to put a smile on your mom’s face. 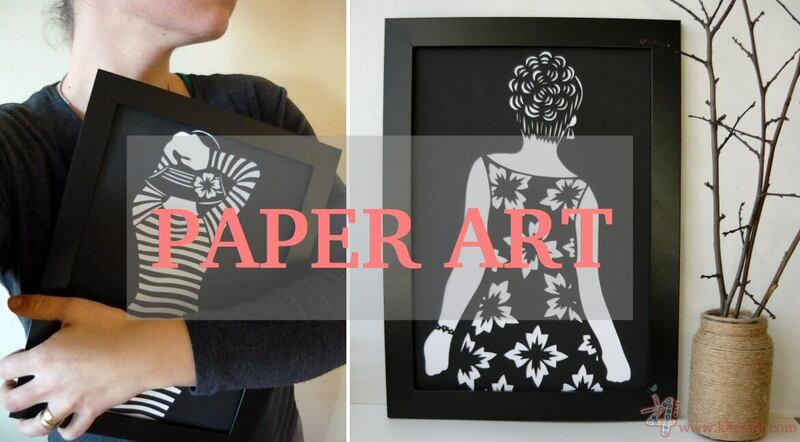 Amazing Paper Art – Clothes that do not wear!! Love to try new things and new experiences. Art keeps my creative mind running and new ideas are adrenaline rush for me. Any work that involves some form of creativity inspires me no matter the medium.